The artist formerly known as Chip tha Ripper has maintained a low profile so far this year. In fact, we last heard from King Chip with the inauguration of his new pseudonym on his mixtape Tell Ya Friends last January. 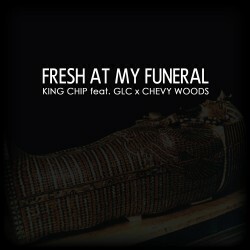 Now, Chip returns with the extremely smooth “Fresh At My Funeral”, which finds the MC picking up where he left off. The record features Chicago vet GLC and Taylor Gang’s Chevy Woods, and it’s a funky cut that showcases all three rappers' skills. Check out the laid-back record below. No word yet on where this will land, so just groove for now and be on the lookout for Chip’s next project, 44108, this September.